I am sick. sick. sick. it is sad. sad. sad. try this out for a mean combination - I have bronchitis, mono, a swollen liver and a fierce case of the hiccups. and now, the left side of my throat has swollen up like a grapefruit. wait . . . does this sound familiar? needless to say, I feel like poo. I don't exactly have the energy to post about the things I promised. two weeks of almost of no posting! madness! 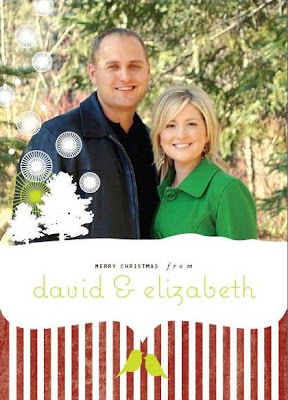 here's one thing I can show you - the proof of our christmas cards from minted. since I only ordered 25 of them, I'll be honest . . . most of you won't be getting one in the mail but consider this my christmas wish from me to you. I hope you feel better soon. REST! aww, that sounds terrible!! get well soon! Sorry you're so sick. I hope you get better soon. Ugh! I hate mono. It's only cool to get it when you're in high school and you can brag about getting the "kissing disease". His name is Dr. Eric Hampton. The practice is Westhampton off of Dobson and Baseline. Do yourself a favor and call him. Your mono will be gone lickity split and you will not only bow to him from here on out, but you will be skippen' around in no time! Seriously... call him! Yes... you just got advise from a total stranger because I really do care about your health! Go figure?! Merry Christmas! Beatiful picture - your coat goes perfectly with the card!! And...you have the kissing disease!! :) Hee Hee...I feel like I'm in middle school. But, seriously feel better soon! So sorry you are not feeling well! Beautiful pictures! I love your coat, where did you get it from? I have been looking for a new one and I love that color! Love your card. You two look very happy. I do hope you feel better soon. Things, yucky things, are in the air. We are sick also. Darling Liz! Do we have matching coats? I think so. What a cute picture and Christmas Card. Get your jammies on and get in bed. Take care, and I hope you feel better soon. I am soooooooooo sorry you are sick. I pray you get better quickly! You poor thing! You sound sick as a dog! How did that happen??? I am so sorry! That is no fun! But on a happier note... your Christmas cards are adorable! You look gorgeous as always! I love the color of your jacket!!! lizzy they turned out so perfect! and i'm so sorry that you are sick sick sick...but we'll forgive you the non-posting, just relax your little self...and please don't kill me for posting that pic, i think it's cute...with the meatballs and all...but i will say i hesitated putting it up since i knew you didn't prefer it...but you're just too hard on yourself, you're gorgeous, xo. That is a bummer. I hate being sick. Cute picture though. Think happy thoughts! Get some rest and yes, I agree that is a horrid combination. I'll keep you in my prayers!!! That is a lot going on with you right now! I sent a prayer for you and I hope you get better fast so you can enjoy your holidays! Cute pics! Your card is so beautiful! And you're going to be included in my prayers...I will be praying that you recover from your illnesses soon soon soon! gorgeous card! you look wonderful! take care of yourself! i know you are being well cared for by your family, if there is anything i can do lemme know! Get better soon! Darling card! I am a lurker, but a harmless one. Just want to tell you how sorry I am that you feel so rotten. Try soup. Try to get someone else to make and bring it to you and give you lots of sympathy as well. It may not make you well any sooner, but it should make you feel a little better!